Inside view: Colour-blind in a recession | What Car? The recession has given the chattering classes something other than carbon footprints to talk about. People no longer invite you for supper to feast on the latest CO2 gossip: we have more pressing matters to whet our appetite. We're more worried about going into the red than being green. A downturn doesn't mean that the cars-and-CO2 issue has gone away, but it's certainly been put on the back burner for many. There's still overwhelming evidence that if we don't do something about global warming soon, the effects will be irreversible; the ice caps will melt, seas will rise and polar bears will have nowhere to live. Cars may not be the chief culprits in all this the European Union's own statistics say they are responsible for only 12% of the continent's CO2 output but they'll be expected to play a disproportionate role in finding a solution. If you make or drive a car, you're a soft target. At the Geneva motor show in three weeks' time, the car industry will present its latest ideas for lowering the average CO2 emissions of cars. They will be looking at everything from the here-and-now to the downright fanciful, electric cars, hybrids, hydrogen fuel cells, biofuel and, for all we know, cars that can run on five pints of cider and a kebab. Chief executives will deliver carefully prepared speeches outlining visions of a green automotive future. Occasionally, this can make them sound like a market trader trying to flog you a 24-piece tea set. 'I'm not going to say 150g/km; not even 120g/km. Our new Ecowonder Mark III' And so we move on to the next presentation to hear more of the same. The thing about cars' CO2 output is that it is totally proportional to fuel consumption. 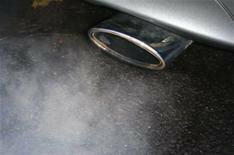 The level of emissions produced is intrinsically linked to how efficient the person behind the wheel is. The more economically you drive, the cleaner your car will be. The trouble is that we all know how difficult it is to get within 10% of the quoted average economy figure of a car, and therefore its official CO2 rating. Drive on a motorway with your clog down, and those figures can be worsened by 30%. Spend all your time doing short journeys in traffic with the air-con and stereo working overtime and you'll increase fuel consumption and CO2 by as much as 60%. Do you think the Toyota Prius driver we saw hammering up the outside lane of the M40 the other day is aware of this? Or does he still think he's helping to save the planet?